I have been spreading the word about Can-C™ eye drops for eight years now. Why? Reports from research studies tell us that Can-C™ eye drops can be a viable option to surgery. A clinical study was designed to document and quantify the changes in lens clarity over a 6 to 24 month period. The average age of the participants was 65. All subjects suffered from senile cataracts of a minimal to an advanced opacification. The patients received either a 1% solution of N-acetylcarnosine eye-drops or a placebo as 2-drops twice a day into each eye. ▶ 90% had an improvement in visual acuity. ▶ 88.9% had an improvement of glare sensitivity. 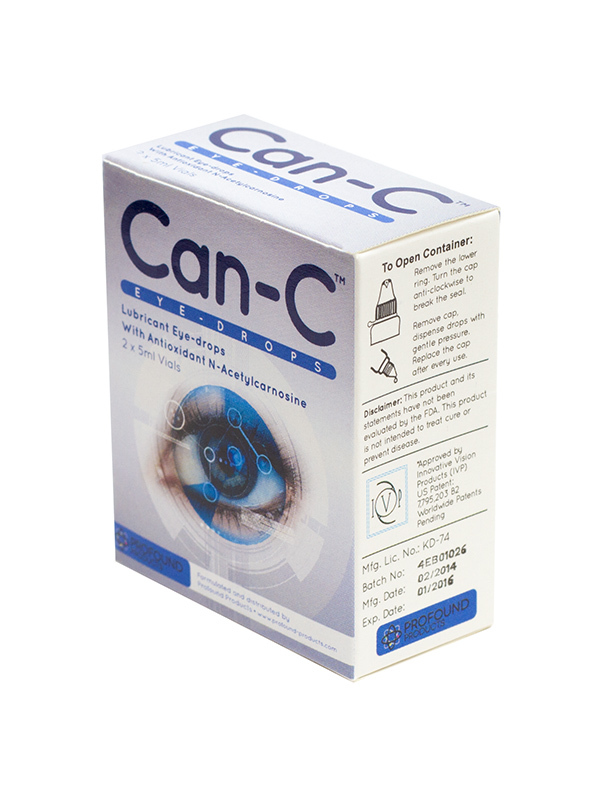 Can-C™ eye drops have been designed to get inflammation in the body under control. Once inflammation is under control, the body can do a better job at healing conditions such as eye twitches, dry eyes, double vision and vision problems in general. What are the Can-C™ Ingredients? It is now well known that a cataract is the result of elevating levels of “ascorbate oxidation” or oxidative stress due in part to oxygen free radicals in the eye. This unchecked oxidation results in the cross linking of lens proteins, which is known as a slow glycosylation process. Cross linking of the lens proteins eventually causes a yellowing or browning pigmentation of the lens or (lens opacification) limiting the amount of light that reaches the retina. This is why vision worsens gradually over time. This degenerative process occurs and advances as the natural antioxidant supply in the eye diminishes. Critical antioxidant supplies are continually being tapped from the eye for protection against over exposure to ultraviolet light and against toxins and chemicals present in the air we breathe, the food we eat and against the hours we spend looking at our computer screens, and so on. What Do You Receive When You Order Can-C Eye Drops? Each box of Can-C™ contains two 5 ml vials and each 5ml vial contains approximately 75-drops. One box lasts approximately three weeks. Shipping is free to all US destinations. Look for the following statement on any box you purchase to be sure you are purchasing Dr. Babizhayevs’ patent protected formula. – “Approved by Innovative Vision Products.” While there are several other private label products available, Can-C™ is the original formula. Finding the above statement on the box ensures that you have purchased the correct and only clinically tested product. Can-C™ eye drops over the past decade. Some offer this product at a price slightly less than my prices, though my prices remain competitive. Now if price is your only criteria – go for it. You may be able to find a company that offers Can-C™ at a slightly better price than available through my website. Before you launch a search for a better price, I want you to know the difference between ordering from me – I am a small USA business in Washington state – and ordering from another company that has a slightly lower price. My company is located in Olympia, Washington, USA. All of the profits from sales of Can-C™ eye drops stay in the USA. My staff is comprised of one person – Robert. He cares about your well being and that of your family. When you call the toll free number [877-526-4646] Robert answers the phone. If he is talking with another customer when you call, he will return your call if you leave a message. Feel free to test this out before you order! Shipping on all orders to US destinations is free. Shipping to destinations outside the US is $6.95. I make every effort to ship out orders the same day they are received if possible. Shipping is by United States Postal Service (usps.com) first class mail. Deliveries usually arrive in the USA within three (3) business days after they are posted,. Sometimes they arrive sooner. Shipments to foreign countries can take one to three weeks depending on custom delays. Additional customs charges may apply depending on the country. You can always call our toll free number 877-526-4646 and get your questions answered. Again, Robert answers any and all questions. Lastly, there are other companies that claim they are selling Can-C™ – but it is not the original formulation which was used in the Can-C™ research studies. They sell it for less but the products are not the same as the authentic Can-C™eye drops formulated by Dr. Babizhayev. When you purchase from Zero Point Healers, you can be sure that you will receive the genuine Can-C™ eye drops. In short, if price is your only criteria, our competitors will not hesitate to take your order. If the services listed above appeal to you, I will be most happy to answer your questions, process your order and always be there for you. One box of Can-C eye drops costs $39.00. Shipping to destinations in the United States is free. Shipping to destinations outside the United States is $6.95. Order two (2) boxes of Can-C at $39.00 per box or $78.00. Each box contains two 5 ml vials so you receive 4 vials in total. Shipping to destinations in the United States is free. Shipping to destinations outside the United States is $6.95. Order three (3) boxes of Can-C for a discount of $35 per box or $105 for the three boxes. Each box contains two 5 ml vials, so you will receive a total of eight (6) vials in all. Shipping to destinations in the United States is free. Shipping to destinations outside the United States is $6.95. Order four (4) boxes of Can-C for a discount of $35 per box or $140 for four boxes. Each box contains two 5 ml vials, so you will receive a total of eight (8) vials in all. Shipping to destinations in the United States is free. Shipping to destinations outside the United States is $6.95. Order six (6) boxes of Can-C for a discount of $31.50 per box for a total of $189.00. There are two five (5) ml vials in each box so you will receive a total of 12 vials. Shipping to destinations in the United States is free. Shipping to destinations outside the United States is $6.95. Can-C Plus is a supplement that was formulated by Dr Babychevez PhD to help support protection of free radicals and reduce the damage caused by oxidation inside the eye. This supplement may be useful in cases where cataracts are mature and have calcified, or in situations where other chronic health conditions are involved. Shipping to United States destinations for the 90 Can-C Plus tablets is $3.00. Shipping to destinations outside the United States is $9.95. My uncle Gordon had cataract surgery that resulted in a severe loss of sight in one eye. After his sight was impaired he was no longer able to play tennis or read books, his two most treasured hobbies. Had the Can-C™ eye drops been available when Cordon’s vision was obstructed from cataracts, I wonder whether he would have been able to avoid surgery. I am also thinking he would be alive today, playing the game of tennis and reading, the two hobbies that he dearly loved. Of course, surgery is an awesome option for many people but for a few people like my uncle Gordon, irreversible complications emerge. May your eyes shine brighter with each passing day. May your experience of the world sharpen as your vision is improved. May you see the world through a fresh set of eyes that give you endless hope, joy and happiness. P.S.- Why not offer your body the opportunity to heal itself?. Reduce inflammation the natural way and allow your eyes to come back into balance and harmony.